For my baby niece’s first birthday, I bought her a moneybox. It was a really nice silver one, engraved with her name and the date of her first birthday. She doesn’t have a clue what it is, or what’s in it, so why did I bother? 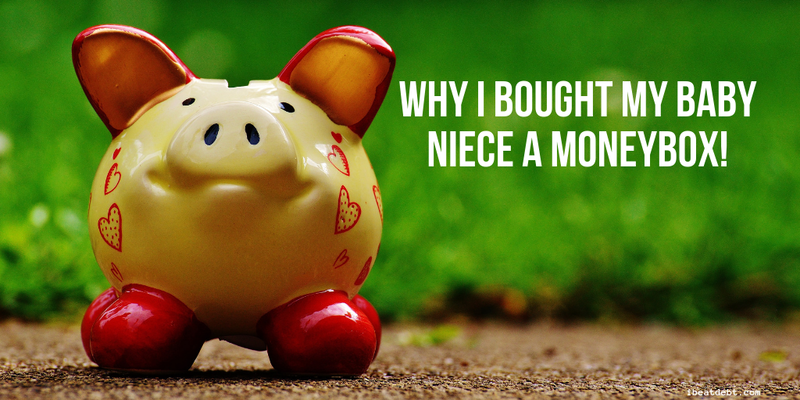 The simple answer is that because I love her, I want her to grow up knowing the value of money. If I had fully understood the impact of defaulting on credit cards, or how hard going through debt management was, I would like to think I wouldn’t have made the mistakes that I did. Whilst I am now pleased I have learnt those lessons and really hope that I don’t make those mistakes again, it would have been lovely never to have made them in the first place. I am only an Aunty, not a parent, so ultimately I can’t make decisions about pocket money or things like that, but I do want to be a hands on aunt, who encourages her niece to learn about things by being open and talking about them. Being British often means we don’t talk about things like money – it’s not the done thing. That needs to change. 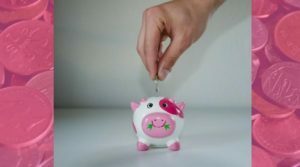 Much as we don’t want to be people who are focused solely on money, it is an important part of our lives and one that we should be educating the next generation about. I will play money games with my niece. When she is older I will help her spend and save any pocket money she gets. As she gets even older I will help her work out how to budget and plan for the future. I will be open and honest about my experience and my mistakes in the hope that she doesn’t make them too. She’s only 1 now, so this is all a long way off, but personally I believe it is an important life lesson that I very much hope to be able to be part of. She is a baby now but as she grows up, I will buy her things, and give her gifts. I also want her to understand about money though. My experience of being in debt, and getting out of it again, has been very insightful. I didn’t have formal money management lessons at school, and whilst the number of those receiving money education in school is increasing, it is not (in my opinion) enough. Are you on Pinterest? 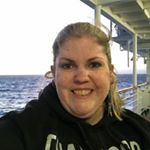 I have several boards all about making money, saving money and my debt experience. I also have a board about Money & Children. If you’d like some more ideas about how to help the young people in your life learn about money, definitely check out this board. 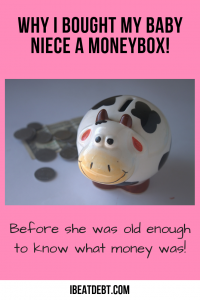 As my niece grows up I will be using it for inspiration of loads of great activities that I can do with her to continue to help her learn about money!